Stark Industries is a global aerospace, defense, security, and advanced technologies corporation with worldwide interests. Their impact is incredible, and it’s coming to your FLGS! 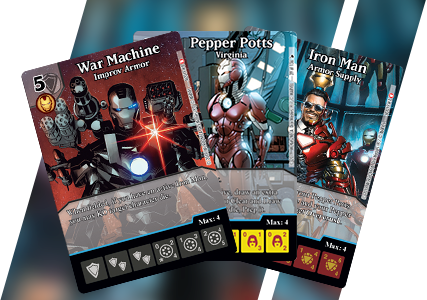 Advance your game with the brilliant minds behind Stark Industries, including Pepper Potts, Iron Man, and War Machine! In the Marvel Dice Masters: Stark Industries Monthly OP Kit players face off in tournament play at their FLGS for the chance to win exclusive prizes. Once your store is registered in the WIN, you can schedule your Marvel Dice Masters: Stark Industries OP event using the official template in the “create an event” section of the site! The Marvel Dice Masters: Stark Industries OP expands on the Dice Masters Organized Play event series based on the Marvel Universe.